This product has an estimated arrival date of Wednesday, May 01, 2019. Jean-Claude et Nicolas Fayolle Estate Nicolas Fayolle represents the 3rd generation. His father, Jean-Claude, helped convert the Estate from Apricot to Grape growing. Date Founded: 1958 Owner: Jean-Claude and Nicolas Fayolle Winery Philosophy: All our vineyards are tended and harvested manually due to the incline of the slopes. We also limit treatment of the vines to better manage soil erosion. Our “cuvees” are issued for specific parcels in our vineyards and we neither destem nor use new oak barrels to preserve each “cuvee’s” specificity. The estate was founded by Nicolas' grand-father Jules Fayolle in 1958. Nicolas is the 3rd generation in this family owned estate. Nicolas has a degree in "Viticulture- Oenologie" and "Commercial science". 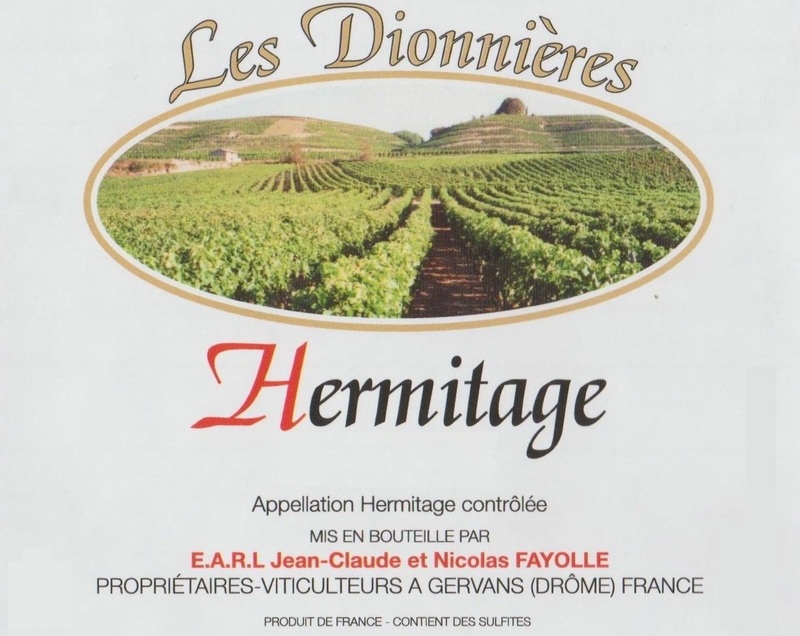 He studied in the Macon region and joined the family estate in 2003 Winery Acreage: 17.36 acres (7 hectares) Winery Production: 2000 / 9L cases Varietals Produced: Syrah and Marsanne Winemaker: Nicolas Fayolle 7 hectares total: 4 hectares of Crozes Hermitage Rouge in the lieu dit "En Rochettes" 2 hectares of Crozes Hermitage Blanc in the lieu dit "En Rochettes" 0.8 hectares of Hermitage Rouge in the lieu dit "Les Donnières" 0.2 hectares of Hermitage Blanc in the lieu dit "Les Donnières" Soil is mainly Loess, Red granit, granit from the former Rhone river bed. 80% of the vineyards are located on steep hills and terraces. Hand harvest. Principal El Principal Cabernet Sauvignon is a blend of 90% Cabernet Sauvignon, 7% Petit Verdot and 3% Syrah originating from old, ungrafted vines. Deep, intense ruby red, black fruit and cassis aromas, well-integrated woody notes, great structure and balance. Ripe and present tannins, elegant and sophisticated in the mouth, a pure expression of the terroir. Soil: Alluvial origin, Clay loam. Climate: Sub humid Mediterranean with big influence of the Andes Mountains. Thermal oscillation: Between 18º and 22ºC. Cool maceration (8°C): 6 days. Post fermentative maceration: 16 days. Bottle aging: Minimum 2 year in the bottle before release to the market. "This complex cuvée of mostly Cabernet Sauvignon with 7% Petit Verdot and 3% Syrah from some of the highest vineyards in Pirque is built to age in bottle. Aged in 75) new wood, it’s serious, concentrated yet beautifully balanced, with very fine tannins, some aromatic mocha oak, layers of dark fruit and a backbone of acidity. 2022-30"
Jean-Michel Sorbe Quincy Blanc is made from 100 percent Sauvingon Blanc. The first nose is expressive and opens up to notes of acacia, citrus (lemon, grapefruit). Full on the palate with lovely freshness. This wine boasts nice balance and good length. The vines are 15 to 20 years old and are located on the left bank of the Cher River, southwest of Quincy. This vineyard enjoys good exposure to the sun and overlies hillocks composed of sandy alluvial deposits and gravel dating back to the Quaternary Period. Each terroir is managed with minimal intervention in an environmentally friendly approach. Vinification: Slow pressing. Fermentation took place under controlled temperatures (18°C).The wine was aged on fine lees for a minimum of 4 months. It was filtered only once before being bottled. Pair with crustaceans, asparagus, or goat's cheeses. After pouring, allow the wine to breathe for a few moments in the glass before enjoying so that it may fully release all of its aromas.